This picture is one of the most popular works of the French artist Nicola Poussin. Such a religious plot was duplicated many times by other artists, since biblical stories are fanned with a halo of allegories and parables, and this is a favorite moment of sculptors, artists and poets. The picture tells us the story described in the Gospel of Matthew. The Magi, from the East, led by a star, went to Bethlehem in order to look at the King of Judea, Christ, born of the holy virgin Mary. King Herod desired the death of the holy Infant, for which the king ordered to inform him of where the Child is, saying that he allegedly wants to worship Him. The cunning ruler most of all was afraid of losing power, so he decided on such meanness. On the canvas depicts the mother of the baby – the Holy Virgin Mary. In her lap, She proudly holds a beloved child, carefully clasping His hands. On the face of the Holy see a gentle smile, indicating the pride and joy of motherhood. So, Mary and the Baby are the lightest part of the picture, which symbolizes the holiness and divine origin of the Mother and the Baby. Among the expressive wise men who surrounded the caring Mother, enveloped in admiration, worship and prostration before the Holy One, the Virgin Mary and her child are also distinguished by pronounced calmness: it seems that their hearts are filled with bliss and peace. This biblical story in the paintings of other masters had rather strict requirements, so incense should symbolize the holiness of Christ, myrrh – to predict His death. 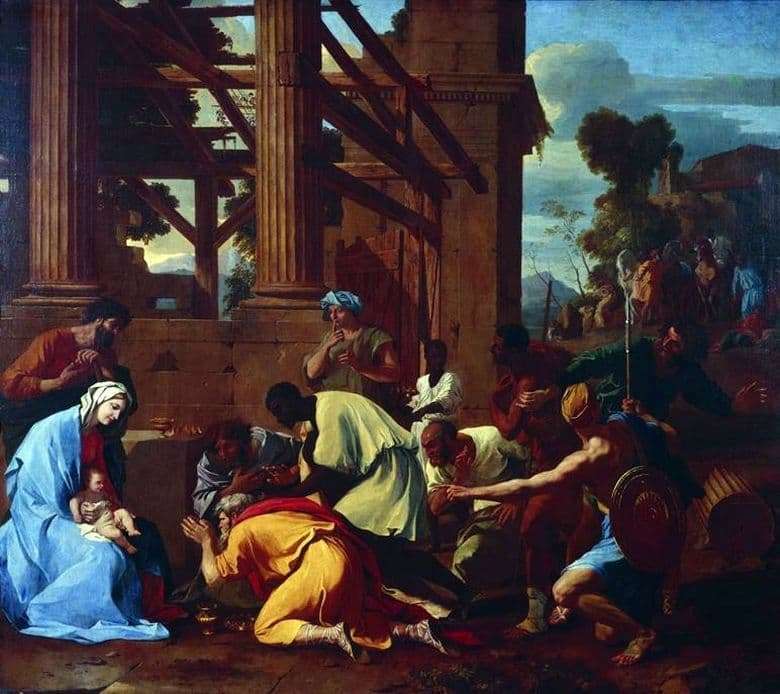 However, Nicolas Poussin decided to approach this task in his own way: instead of a solemn event filled with symbolism, he described the natural joy of the birth of the Child.